July 13, 2017—Since the first generally accepted credit card the payments industry has sought better and more efficient ways increase usage. The advent of loyalty and incentive programs brought powerful tools, the economics of which must be carefully managed. In the current payments eco-system, there has never been more competition for the consumer’s wallet. Every card issuer is searching for strategic differentiation that will lure customers, keep customers or create a new asset that can be monetized. NYPAY and leaders in this field to discuss innovations in credit cards. The event was hosted by SAP at their brand-new Hudson Yards offices. April 27, 2017—NYPAY assembled panelists and participants for a conversation on how fintech innovation is improving the lives of underserved consumers. The Center for Financial Services Innovation shared the latest research on the needs of consumers, how innovators are responding, and trends in the fintech market, while StartupBootCamp – Fintech shared the global perspective of their organization which operates Fintech accelerators in NY, London, Mumbai, and Singapore, as part of their broader network. March 13, 2017—The vast majority of consumers use a default method when making digital payments, with huge potential consequences for players throughout the payments value chain. NYPAY explores the implications of this overlooked trend, leveraging new research by Deloitte, with a high-level panel discussion by card issuers, merchants, technology companies, and more. Discussion centers on new Deloitte research into “default payments”–transactions using pre-stored payment details–which make up an estimated 84% of digital transactions. Default payments provide consumer convenience and allow for a faster settlement with little or no intervention, but that convenience has outsized implications for card issuers, merchants, and others in the payments/FinTech world. November 15, 2016—Fraud has always been a part of commerce. As the world becomes more and more digital, fraud follows because, to use that famous phrase, “That’s where the money is.” Fast internet connections are widely available across the globe. Hackers everywhere use this connectivity to probe the entire internet for weaknesses and exploit them. If technology facilitates fraud, how good is it at playing defense? October 18, 2016—MasterCard’s planned purchase of Vocalink, both networks partnering with PayPal – what do these recent moves by the global card networks portend in terms of their strategic approaches? Are their strategies diverging? Is MasterCard is becoming more of a payments processor? Is Visa is concentrating on network expansion? What is the overall direction of the networks? What do these and other recent moves imply about each network’s attempts to grow and differentiate? Are these moves all in anticipation of real-time payments launching in the US? Will real-time payment disrupt the networks’ traditional business and growth – or will the networks leverage this shift to expand further? August 17, 2016—Join NYPAY and experts from IBM, CLSA, Mastercard and Ringly to learn about IoT (the Internet of Things) and payments– what it will mean as objects communicate and transact. July 19, 2016—Over the past few years, the FinTech scenes in London, Copenhagen, and other European cities have proven as vibrant as those in NY, Silicon Valley, and other major US markets – if not more. As regulatory compliance requirements have also exponentially increased, entrepreneurs have responded by launching “RegTech” platforms, which make compliance more efficient via the intelligent use of technology. 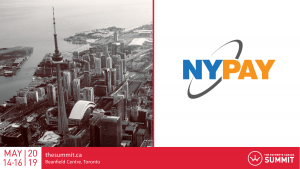 Join NYPAY and the British Consulate’s UK Trade & Investment for a dialogue that explores the current state of the RegTech market, the impact that different regulatory schemes have on FinTech innovation, and the potential impact of the Brexit on the UK’s position of being friendly environment for entrepreneurs in this space. June 7, 2016—Growing at an annual rate of 16%, prepaid products are getting a lot of attention as the fastest growing segment in retail payments. For many consumers, prepaid cards—including cards onto which paychecks or government benefits can be loaded—are already invaluable, enabling the consumer to make payments in instances where checks or cash cannot be used. Increasingly, prepaid cards are viewed as a forerunner to a new generation of deposit and savings products as well as a means of providing financial services to people who don’t want—or can’t get—bank accounts. As a result, regulators, notably the Consumer Financial Protection Bureau, have proposed regulations protecting the rights of consumers for prepaid, debt collection and payday lending. The CFPB’s intent is to protect consumers, but finding the balance between achieving that goal and facilitating—rather than squelching—financial inclusion and innovation is a difficult task. Hear one of the authors of the Dodd-Frank Act and prepaid providers debate the relative merits of the CFPB’s intent. EMV 8 Months Later: Was That Really What We Expected? May, 3, 2016—We’ve heard much about a “US mandate for EMV”, which sounds straightforward: those involved had to do something. The truth is different, more nuanced, and certainly more interesting. On October 1st 2015 the payment networks instituted a liability shift for US face-to-face (a.k.a. “card present”) transactions when there is fraud that EMV could have prevented-chiefly counterfeit cards. Eight months in, what is going on? Who is benefiting? And, who is complaining? Join NYPAY for an update on the migration to EMV in the US, early results / findings, and to hear from parties directly affected by this change. April 13, 2016—Whether you believe virtual currencies like bitcoin will replace national currencies wherever we pay, or think that the blockchain will be used as the technology backbone for “hard jobs” like cross-border payments, one thing seems clear – the role of payment intermediaries and providers in payments will change! Topics include: What type of payments are most likely to be affected by blockchain adoption? Are retail payments up for grabs? Or, will blockchain adoption be centered on certain “use” cases, like cross-border remittance, P2P and online retail transactions? Will the blockchain have a role in helping the US and other markets fulfill the goals of their faster payments initiatives? How will traditional intermediaries and providers in the payments value chain be impacted? Will they adopt the blockchain? Which of their current functions will be reduced or eliminated? How will traditional players need to adapt to remain relevant? Will new functions emerge as the blockchain is adopted in payments? Will new intermediaries emerge to deliver these functions, or will traditional players fill the gap? Will the cost of payments really be reduced? Who will be the winners and the losers? Will the average consumer or merchant truly benefit?